Making the most of our clients' outdoor areas requires professional landscape designing and technical performance for its realization. 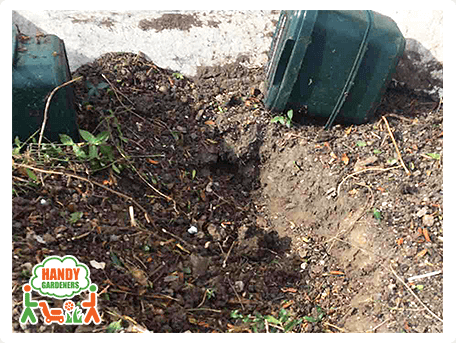 Our seasoned landscapers are always ready to transform your front and back garden into the stylish and practical green heaven you have wished for. 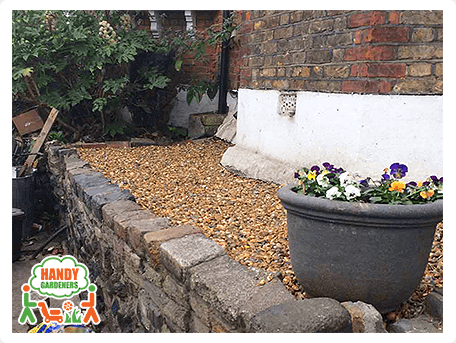 A compact front garden in Hornsey, N8 needed our attention and professional care, so we scheduled a visit to discuss the ideas of our kind hosts for its makeover. From there on, the main steps for the landscaping job required were clear: a wooden gate and fence to be created, removal of the existing gravel and spreading a new one and cement borders to be built. 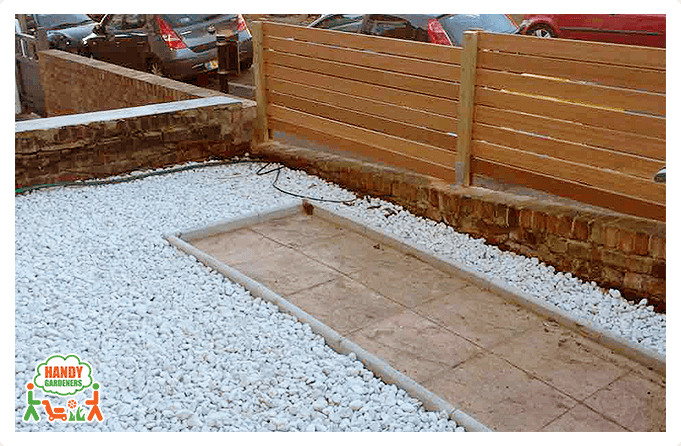 Here are listed all the details regarding each step we took on our way to creating a calm and soothing outdoor area for our customers in Surrey Quays, SE16. Step 1. 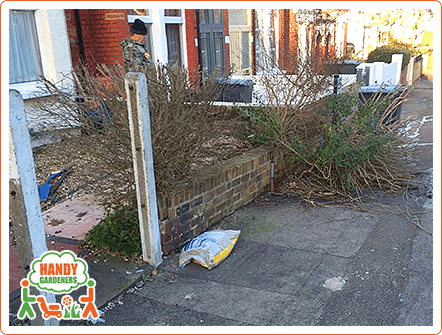 On our way to creating a beautiful front garden we had to clear the area from the excessive greenery, shrubs and old gravel. 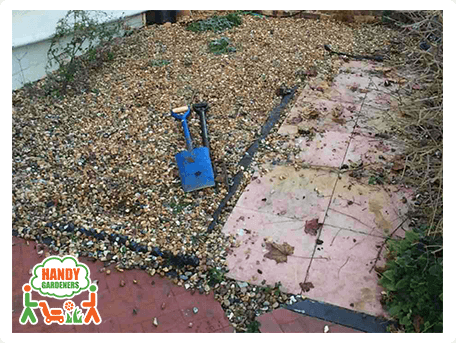 Initially, we had discussed every aspect of the job and proper tidying was the first part of it. Once the team had revealed the features of the garden, they started preparing it for the next stages of the landscape project to take place. Step 2. The second important step of turning the neglected front garden into a pleasant area was to rake the ground so the soil could be broke down and it was properly leveled. The next thing to do prior to the laying of the new gravel was to lay a membrane and use it as a solid base for the brand new aesthetic gravel we were to lay next. Step 3. The shining star of this project was the gravel. Before supplying it for our clients on the day of its laying, we had provided them with a vast range of options. 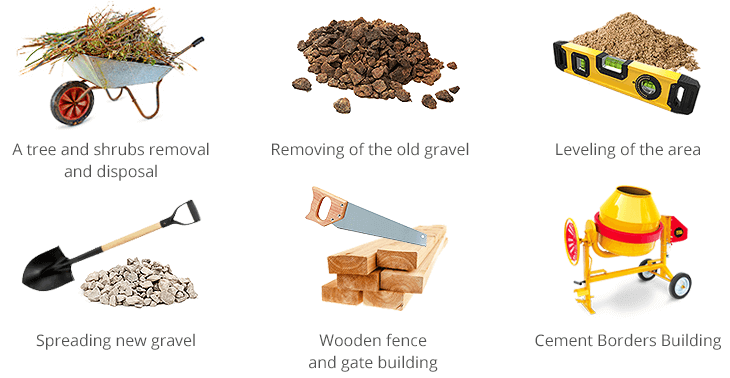 In view of the fact that we always give our customers the chance to select the materials we are going to use in landscaping their garden, we only advice them on the most reasonable options for their particular case. The gravel size and type selection depends on the foot traffic the area will receive. Step 4. Details count in every garden, no matter how small or big it is, so creating clean garden borders suited the needs of this landscape project the best. Our handy landscapers used cement borders in order to develop a complimenting finishing touch to the entire look of the gravel area. They framed the paved pathway in an astonishing way. Step 5. 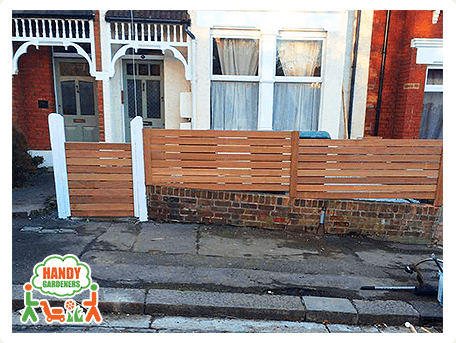 Having a beautiful wooden fence not only represents your front garden, but also secures the privacy every family needs. No garden fence would be accomplished without a proper wooden gate installed along with it. 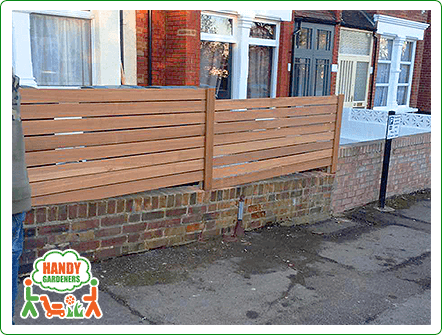 So we were next to build a good-looking fence and presentable gate, both made of high-quality wooden materials, so they would stand the test of time while adding beauty to our customers' home in Hornsey, N8. 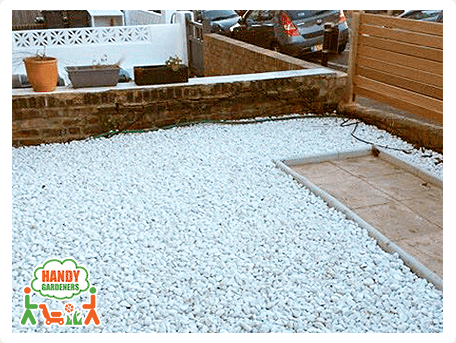 Entrusting your London garden to Handy Gardeners means that you have an excellent team of landscapers at your disposal and ready to get creative with turning any outdoor space into a garden to brag about!